At The Natural Step Canada, we are increasingly hearing calls for "more innovation" and "more collaboration" to facilitate progress on sustainability challenges. Many organizations – including many of our own clients and partners – have recognized that there is only so much that they can achieve on their own, and that there are plenty of obstacles to overcome in partnership with suppliers, customers, regulators, and yes, even their competitors. These sentiments certainly resonate with us at The Natural Step; we increasingly feel that our work to create role model organizations isn't resulting in great enough change. Our response to this is an increased focus on multi-stakeholder collaboration to identify and address crucial sustainability challenges that no one entity can successfully address on its own. We call these initiatives Sustainability Transition Labs, but these types of projects are also referred to elsewhere as change labs, Collective Impact projects, and more. What these projects have in common is that they all seek to establish a shared vision of success and a methodical approach to creating value for all participant stakeholders (e.g. the Collective Impact model calls for a common agenda, shared measurement systems, mutually reinforcing activities, continuous communication, and backbone support organizations). A participant in one of our Alberta pilot projects recently reflected on the appropriateness of the name “Sustainability Transition Lab”. 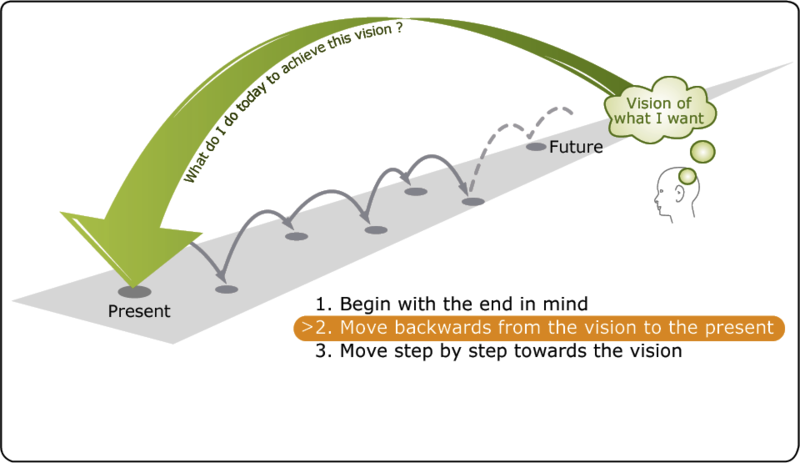 If we want to transition from one thing to something else, we need to define what a successful outcome looks like (i.e. the "something else"). The strategic approach of backcasting calls for us to i) define a successful outcome; ii) evaluate where we currently stand relative to that vision of success; and iii) chart a course to close the gap. We close the gap by exploring the leverage points for change and piloting solutions that we can scale up, which sounds a lot like the type of trial and experimentation you would observe in a traditional lab! Backcasting from sustainability principles enables a common language and shared understanding to emerge, which helps define what it will take for the system in question to achieve sustainability. In other words, it provides an answer to the question, "how will we know when have achieved sustainability?" With that vision established, we can be truly strategic about how we allocate resources to tackle challenges, in order to move in the right direction. You can read more about the benefits of participating in a Sustainability Transition Lab project here. For further information about this project please contact us at info(at)naturalstep.ca. Registration for the ACCELERATE: Collaborating for Sustainability Conference is Now Open! The Natural Step Canada's MBA Sustainability Bootcamp is Coming to Edmonton! Help Us Make The Next Ten Years A Huge Step Towards Canadian Sustainability!